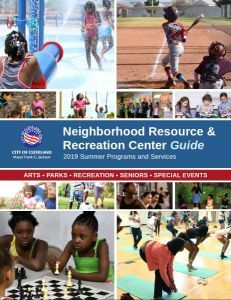 Seasonal activities at City of Cleveland Recreation Centers include organized sports, playground activities, performance arts, ice skating, camping, and more. Activities are designed for participants from the very young to Seniors. Detailed information is available on the tabs below. Contact information for the individual centers can be found here, along with additional recreation center activity schedules and center amenities. 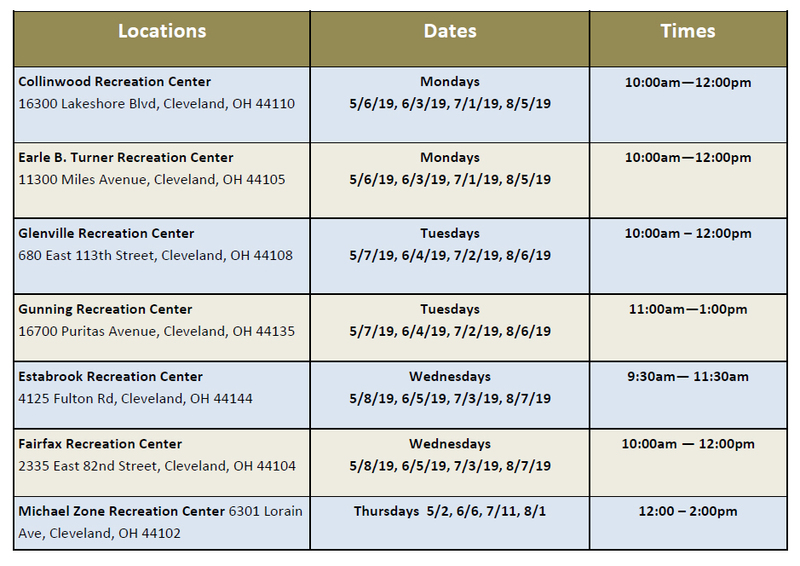 Cleveland recreation centers are open weekdays from 11:30am to 8pm and Saturdays 9:30am to 6:00pm. During summer months, staff is available at many playground locations weekdays from 9:30am to 6pm and they conduct additional activities for youth. Youth will engage in intensive ACT/SAT test prep tutoring to better prepare them to meet the demands of college entrance and Ohio graduation requirements. Program is designed to provide adults GED preparation, English as a Second Language instruction, digital and financial literacy skills. Assistance understanding and completing the college and CTE application process. Financial aid guidance including assistance completing FAFSA forms and financial literacy. College and Career exploration activities including college tours and post-secondary career technical education (CTE) enrollment assistance. Youth and adults ages 16 and up will be afforded job and career readiness training; work experience or technical training, assistance with job placement and coaching support; and job retention and career advancement coaching services. Job readiness workshops will be two weeks in length: 3 hours per day for a total of 30 hours of training. Staff will be available from 11:30 a.m. to 7:30 p.m. for drop-in individual counseling and support on Tuesdays and Thursdays. Youth in grades K-8 will engage in multiple hands-on activities related to Science, Technology, Engineering and Mathematics (STEM). The one week program is designed to reinforce STEM concepts and encourage creativity and self-efficacy among students. In addition, programming includes a day of hands-on exploration and experimentation for youth and their families at the Great Lakes Science Center. Revolving Family Passes - one pass will be housed at each of the 22 recreation centers that will enable youth and their families to visit the Great Lakes Science Center free of charge. Through a collaboration with Youth Opportunities Unlimited, the City of Cleveland will fund the following: 230 Summer Jobs for youth in grades 9-12 and 20 paid internships for youth in grades 10, 11 and 12. Participants will receive career planning, job and career readiness and mentor support. During this 3-week program, youth will engage in hands-on, on-site workshops in which they’ll explore their neighborhoods, identify and design physical improvements to parks and public spaces and construct these improvements on-site as temporary or permanent installations. Participating youth will receive design, construction and safety training, as well as a stipend for their participation in this effort. Applications will be submitted online through Kent State University. Youth will learn the game of chess while enhancing critical thinking and problem-solving skills. Registration is held at all recreation centers. Contact any receation center for information. The Jr. Golf program is not just about youth learning the game of golf. 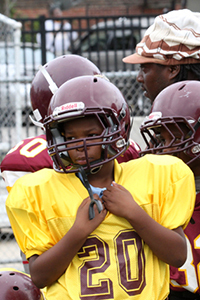 Youth learn sportsmanship, intergrity, respect, confidence, perserverance and honesty. 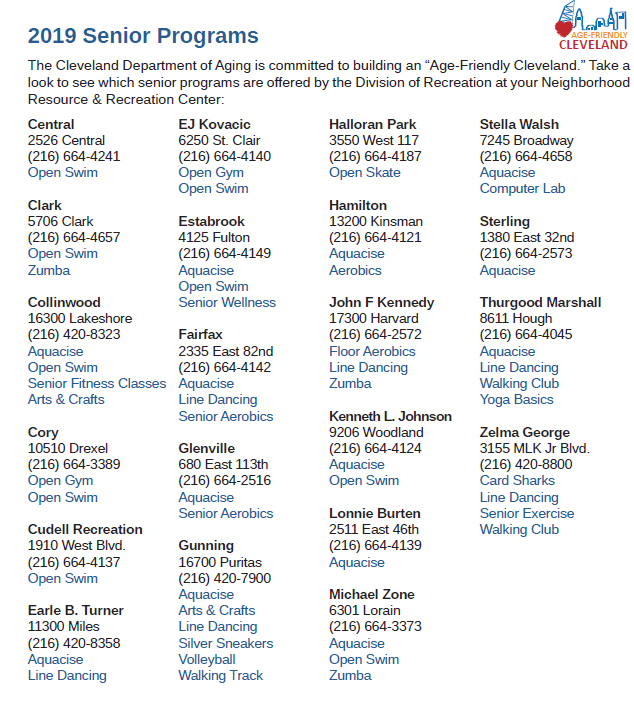 The City of Cleveland has three pick up locations which are Zelma George, Gunning and Glenville. If a child will be transported by a city employee, parents need to have their child at the transportation site by 12 P.M. All kids will arrive back to the site by 3 P.M. Permission slips are required, though registration is not necessary. 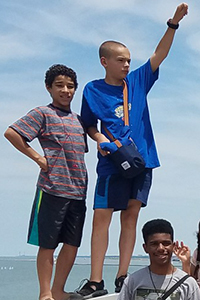 Gunning June 6 9:30 A.M. - 11:00 A.M.
Luke Easter Park June 13 9:30 A.M. - 11:00 A.M.
Camp Forbes is a fully-functional residential camp for children ages 9-13. Camp is offered for eight weeks with 100 children attending each week. Camp Forbes is situated on approximately 33 acres of land in the lush woodlands of Highland Hills. It has 10 cabins, a dining hall, administrative building, an outdoor pool and a pond. Activities include boating, arts & crafts, nature activities, swimming, tent camping, hiking, flag-raising and fishing. To attend camp you must be a City of Cleveland resident. Proof of residency (utility bill, magazine subscription, or mortgage or lease agreement), child’s birth certificate or a copy of immunization records that includes the child’s date of birth are required. (No program week of July 1st). Applications: Can be completed at any Neighborhood Resource & Recreation Center beginning March 1 through May 20, 2019 or at Camp George Forbes through June 14. Participation is free. Youth will learn and play the game of soccer, while at the same time engage in activities that will strengthen their writing and speaking skills. In addition, participants will complete a service-learning project. Join us as we connect seniors to programs and services, provide application assistance, help with benefits and resources, and give information, education, and support, as well as connect to community resources. Recreation Center schedules can be found here. This program is 3 week program aimed at serving adults 18 and over who are struggling financially. The program aims to empower participants and provides them with the tools required to move from poverty to self-sufficiency. Sessions combine concrete skill-building activities related to career development, soft skills and job readiness with exercises designed to help participants navigate barriers in their personal lives, identify resources and envision a brighter future for themselves and their families. Grief and toxic stress group counseling support will be offered to youth who have experienced stresses, traumas and losses in their lives that are having a negative impact on their overall well-being. The program targets youth ages 8-17. Groups are conducted in the following age groups: 8-10 years old, 11-13 years old and 14-17 years old. Fairfax- May 8 - June 26 12:00 P.M. - 2:00 P.M., Cudell- May 10 - June 28 1:30 P.M. - 3:30 P.M.
Sterling- 1st Wednesday of the Month 2:30 P.M., Cudell- 3rd Thursday of the Month 9:30 A.M.
Partnering with the Greater Cleveland Food Bank – come out and get some delicious and nutritious produce! Just bring your ID. A great way to get active, meet new friends and explore our beautiful parks. All fitness levels are welcome – walk at your own pace! Call to register. All walks begin at 10:00 A.M.
League Park June 19 10:00 A.M.
Michael Zone Walking Trail June 26 10:00 A.M.
Zelma George Track July 10 10:00 A.M.
Halloran Park July 17 10:00 A.M.
Collinwood Walking Trail July 24 10:00 A.M.
Fairfax August 7 10:00 A.M.
Novak Park August 14 10:00 A.M. Youth in grades K-12 will study and learn ballet. Classes will include ballet instruction, rehearsals and wellness workshops for healthy habits. The program also includes an exploration of the connection between classic literature and ballet. Participants will meet one hour per week for instruction. Participants will learn acting fundamentals, storytelling methods and ensemble play creation. Youth ages 5-15 will learn different genres of dance - beginning with hip-hop and jazz funk. This provider also is equipped to support youth with cognitive and physical disabilities. Youth will meet once per week for 60-minute classes. Teens, ages 14-18, will learn about drug and alcohol prevention through theater. Performing arts program will include performance poetry and hip-hop music design. Visual arts program will include photography and mural creation/design. This is a sequential, skills based, rigorous performing arts classes that will include dance, drama and vocal music. Parents/families are also welcome and encouraged to participate. This is a 7 week program. Showagon is the City of Cleveland’s summer performing arts troupe made up of young people from all parts of the City. Youth ages 8-18 dance, sing, act and perform poetry on the Showagon stage. The Showagon troupe performs at festivals, recreation centers and community events throughout the summer. The nine-week program begins June 24th through August 9th. The first two weeks are dedicated to rehearsals, and the last seven to performances. Once up and running, the Showagon troupe performs four to five times each week. Our young participants gain invaluable experience that helps them become poised and polished performers. During the rehearsal phase of the program, talented Showagon staff members work with dancers, singers, and poets before they are ready to take the stage. A vocal coach teaches vocal techniques and helps youth select songs appropriate for the show; our choreographer stages exhilarating dance numbers with classy costumes. Play all opponents twice (EXCEPT 2 TEAMS) = 12 scheduled games. Play the other (2) opponents once = 2 Games TOTAL= 14 GAMES. All teams are in the single elimination post season playoffs. Division Champions receive a team trophy League Champions receive a team trophy and t-shirts. Registration is held at all recreation centers. American Division: Play all opponents twice in the division = 12 scheduled games. National Division - Play 4 opponents 3 times and 2 opponents twice in the division = 14 Games. All team are in the single elimination post season playoffs. (2) Separate Playoffs, (1) American and (1) National Divisional winners playoff in best of three series for league title. Division Champions receive a team trophy League Champions receive a team trophy and t-shirts. Play all opponents twice = 14 scheduled games. All teams are in the DOUBLE elimination post season playoffs. Division Champions receive a team trophy League Champions receive a team trophy and t-shirts. Classes are offered on Wednesdays and Fridays; 12 P.M. - 12:45 P.M. There are a total of 21 outdoor city pools including Camp Forbes. Outdoor pool operating hours are Wednesday — Sunday; 12 P.M. - 7:30 P.M. (Closed Monday and Tuesday). If the weather is 85 degrees and higher on Mondays and Tuesdays, the outdoor pools are open. 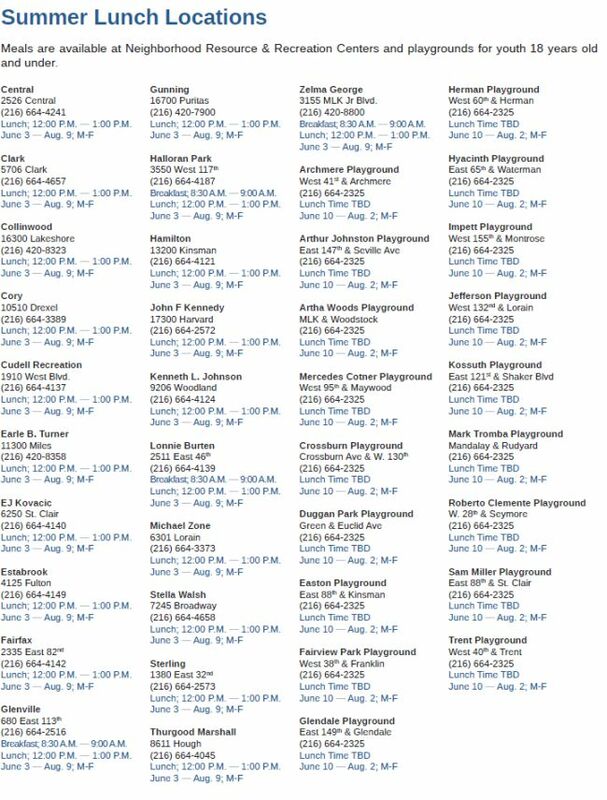 The City of Cleveland staffs 25 playgrounds during the summer. Youth attending these sites can participate in organized board games, sport games, tournaments, arts and crafts and field trips to the Zoo, Edgewater Beach, Skating, The Great Lakes Science Center, Cleveland Cinemas, Cleveland Indians games and even Cedar Point. Children are welcome to drop-in or participate daily. All of the programs and activities are free. The playground special events calendar can be found on the City of Cleveland website, City Hall Room 8 and Neighborhood Resource & Recreation Centers. The Summer Playground Program begins June 10th through August 2nd. (Closed on Thursday, July 4th, 2019) Monday - Friday; 9 A.M. - 5:30 P.M. Participants: Coed Youth ages 8-18. Swim Team classes are offered on Thursdays; 6 P.M. - 7:30 P.M. Swim Team pratice begins: June 20, 27 — July 11, 18, 25. Swim Meets are: July 7, 14; 5 P.M. - 7:30 P.M. Play all division opponents four (4) times = 12 scheduled games. All teams will make the post season double elimination playoffs. Championship Games do not have a time limit. League Champions receive a team trophy and t-shirts. There are no Winter activities scheduled at this time. The Cleveland Division of Recreation is now accepting adult softball team entries. Wednesday March 20 from 5:30 p.m. – 7:00 p.m. The leagues offered are doubleheader leagues.